Hi I am POKERBEN from guild Invicta in Orhdor server, and here is my guide for PVE whisperer, there are multiple skill builds for whisperer to be effective in party or solo(Especially Lupa 100). I'll show you below, this build is for Far-seeing Sapientia set. 60 Cooldown reduction - To max your 50% Cooldown Reduction and the 60 soulpoints soul box for a chance to reset all skills cooldown. My current soul points are 60 CDR, 30 Health, 90 Attack, 60 Crit Dmg, 60 Penetration, X Defense. I am still quite happy with it. This is a MUST have for whisperer's current meta, I have tested it and it reduces both attack and defense used. And It is also very when you have 4 pieces of Far-seeing Sapientia set. It will take quite a while to get this soulstone. But is worth it! I am using full set of True Far-seeing Sapientia(True sets gives you 1 fixed stat), IMO you need at least 4 pieces of this set for it to be useful, 6 pieces for the extra damage and stun for Multi Kill. The extra 200% damage for Multi shot is good! The 4 pieces for this set can be Top/Helm/Gloves/Shoes, you can use Dragon Tights for the extra 10% HP and any mythic shoulder with good stats if you don't like the fixed attack speed stat for this set. Or if you want, you can try out 2 Secret Shadow pieces for the extra 25% Crit Dmg when using Wind sprint. You can afford to have 1 gear to not have Cooldown reduction, you need to get at least 48% Cooldown reduction. 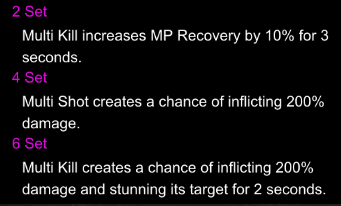 Shoulder: It should have at least or reroll it to Cooldown Reduction, the fixed stat is Attack Speed +5%. The perfect gears will be the ones with good stats and comes with high CC reduction. Below are the skill builds I used for party/solo/Lupa 100, I am using Torment Magnetic Field skill because the passive stat for it is really high and it kills big fat mob/boss really fast, that mini stun and step backwards is really useful even in PVE, especially Lupa 100. This is a all out DPS build, Tree skill IMO is a support skill, that passive isn't really that great either. Full all out DPS since your party have a tanker, you can switch one of the skills to Wind Sprint if you really need it for that moment like Wave/Contaminate mobs in Lupa. You can also switch out multi kill for explosive shot. You can switch out Wind Sprint for Green Sanctum if your party's DPS is high to wipe the boss out fast. Torment Magnetic Field - OP Skill!!!!! try it guys! Bombardment - Self explanatory right guys? Just hang on for Whisperer's buff during Noria patch, Whisperer is really horrible in solo PVP now. Last edited by POKERBEN; 08-07-18, 01:59 PM. Are there any changes at this moment about your guide? I dont know, but when I played whisperer, it seem to be a very very weak. When go on ET, just 1 hit boss and I dead. I use bow, and I just reach lv 65, the items are from mission 65. What I should do now? I sometimes think about changing class to Blader. Nice guide. Did you change anything after noria update? New expert skill on build? Why dont you use death sentence on boss? New sets and soulstones are worthy? THANKS FOR THE GUIDE, well written, always wanted to re-roll a whispere!